On 4 December, Italian voters rejected a proposed constitutional reform in a referendum, with Matteo Renzi subsequently resigning as the country’s prime minister. Nicolò Fraccaroli writes on where the country now stands, arguing that the situation is best captured as a ‘trilemma’ where economic integration, national sovereignty, and democracy create competing pressures on Italy’s economy and political system. The rejection of Matteo Renzi’s constitutional reform occurred in the context of a highly personalised referendum, hinting at a wider rebuff of his policies. Iacopo Mugnai argues that the outcome of the referendum was not a victory for the populists, but a defeat of an electoral machine without political vision. Check out EUROPP’s full coverage of Italy’s constitutional referendum. What does the result of Italy’s constitutional referendum mean for the country moving forward? Valentino Larcinese argues that the vote should be seen as a positive development for Italian democracy, albeit one that has opened up deep divisions which will take time to heal. Italian Prime Minister, Matteo Renzi, has announced he will resign following defeat in the country’s constitutional referendum. We asked a number of EUROPP contributors for their immediate thoughts on the result, Renzi’s resignation, and where Italy is heading next. In the final days of campaigning before Italy’s referendum, we are featuring a number of articles on the pros and cons of the proposed constitutional changes. In this contribution, Corrado Morricone takes issue with recent criticism of the reforms, arguing that they would make the country’s institutions more efficient and responsive to the needs of citizens. The constitutional referendum scheduled for 4 December in Italy has been viewed as a key event for the country’s political stability. 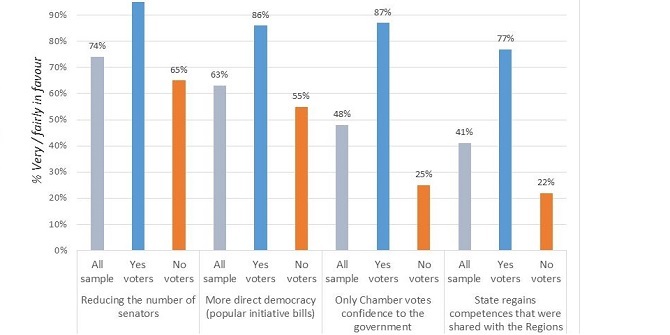 However, James L. Newell argues that the picture is far more complex than has commonly been recognised, with both a yes and a no vote likely to lead to a period of uncertainty.